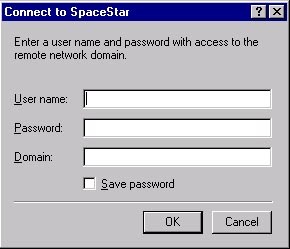 Follow these steps to setup service to Spacestar on your Windows NT system. You may be prompted for your WindowsNT CD, so please have that on hand. Click on the .Install. button. If you do not have all the files needed for Dial-Up Networking, you will be prompted for your WindowsNT installation CD. Make sure that only TCP/IP is checked in these windows. Not doing so may lead to problems when connecting. When you have verified that your settings match the two pictures below, press OK, and OK again to continue. Just click on .OK. for this screen. The following message should appear, completing the installation of Dialup-Networking. The next part will entail configuring Dialup Networking. On the next screen will be a message to restart the computer. (pictured below) Make sure you have anything saved that you need to and click on .Restart..
Now that we have rebooted the computer, and installed Dial-Up Networking, we can continue installing the Internet software. If this is the first time that Dial-Up Networking has been installed the following wizard will appear. Put .Spacestar. as the name of the phonebook entry, and then click .Next..
Click on .I am calling the Internet. and .Send my plain text passwords if that's the only way to connect., then click on .Next.. Enter in the Phone Number of the Modem Pool you will be calling, and click on "Next". After you clicked on .Finish. a box similar to the one above should appear. Click on the .More. button and click on .Edit entry and modem properties.. Call the connection 'Spacestar' and type in the correct telephone number for your calling area. Choose one from the list at the end of the instructions. *Please note, Spacestar is not to be held liable for any long distance charges. If you are uncertain if a number is local for you, please contact your telephone company. Click on the .Server. tab, and uncheck any other protocols other than TCP/IP if they are checked. After you have done that, click on .TCP/IP Settings..
Click on the settings button next to TCP/IP and enter the following numbers for your DNS entries. Make sure both .Use IP header compression. and .Use default gateway on remote network. is checked. After you have done this, click on .OK..
After you clicked .OK. You should be back to the previous screen with the TABS. Click on the .Script. Tab and double check that the script is set to .None.. Next, click on the .Security Tab..
Make sure that .Accept any authentication including clear text. is selected. After you have done this, click on .OK..
You will be returned to the main screen for Dial-Up Networking. Click on .OK. to begin your connection to the Internet. This is the screen you will see to connect on to the Internet. Enter your Username and Password. Important: Make sure that .Domain. is blank. If there is any text in this entry you will most likely be denied access to the internet due to NT not finding its .Domain. that is filled in. After all of the information is filled in, click on .OK. to begin the dialing process.